Assembled from NASA Earth Observatory images by Jesse Allen, using data from the Advanced Microwave Scanning Radiometer 2 AMSR-2 sensor on the Global Change Observation Mission 1st-Water (GCOM-W1) satellite. By as early as 2040, we may experience an ice-free Arctic summer. This news shook the scientific community, as the rate of ice loss was far worse than previously projected. Why is this a big deal? Sea ice is the foundation of the entire Arctic ecosystem; understanding and conserving the Arctic and the animals and people it supports requires understanding sea ice. Ice in the Arctic is typically covered by a layer of snow, which being white, reflects about 80% of the sun’s radiation back to the atmosphere – this is known as the ice-albedo effect. But as the ice melts due to increasing global temperatures, the dark surface of the ocean is exposed. The ocean then absorbs 90% of incoming radiation, warming the water and further accelerating the melting of ice. 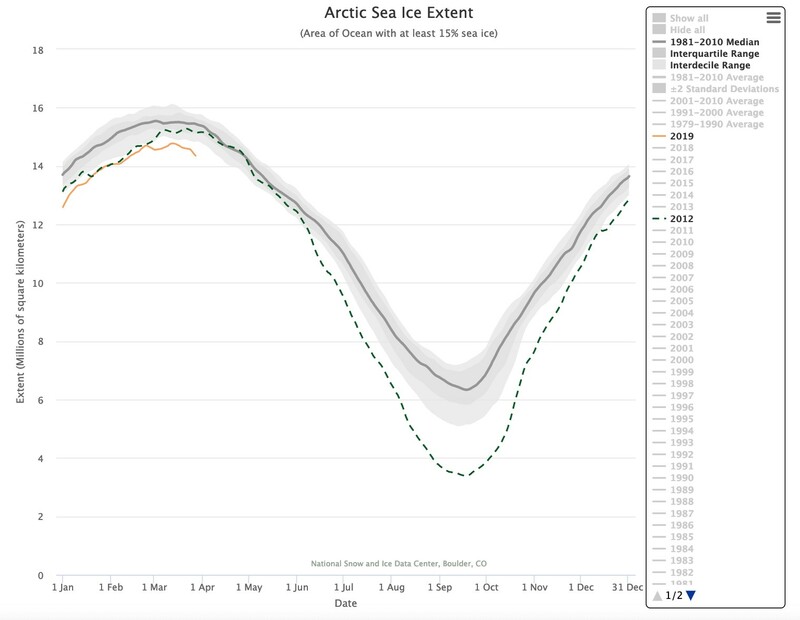 This positive feedback loop is in part what is driving the alarming rate of sea ice loss in the Arctic. Each fall, as temperatures drop and the sun dips below the horizon for months on end, annual sea ice begins to form as the ocean freezes. Nearly all of the Arctic Ocean is frozen over by the end of winter, so the typical maximum ice extent is observed in March. 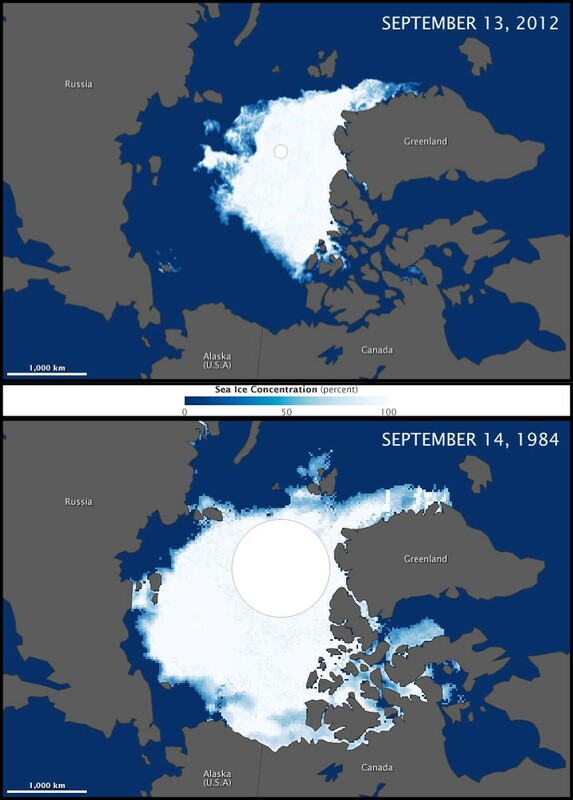 In the spring, as the sunlight begins to return and with it, warmer temperatures, the same ice that froze in the fall begins to melt, so that by September the extent of sea ice is at its minimum. When we look back at the satellite record, we can compare the ice extent from 1979-2012 and see a net loss of two million square kilometers of ice in the summer. The cyclic growth and retreat of annual sea ice is the heartbeat that sustains the Arctic food web. As the sun creeps back in the Arctic skies in the spring, the relatively thin (between 30-70 cm thick) ice is penetrated by sunlight which spurs the growth of algae that grows in and on the bottom of the sea ice. Eventually, the ice starts melting, and as it does, the ice algae is released into the water and sinks to the bottom where it feeds benthic invertebrates. The Arctic benthos is extremely productive because of this ice algae falling from the melting ice; it supports species that feed on the bottom of the ocean like walrus and bearded seals. As the ice continues to retreat and the open ocean is revealed, phytoplankton in the water column experience a similar burst of production due to sunlight and nutrients now available from ocean mixing. The phytoplankton are consumed by zooplankton, which are consumed by bowhead whales, sea birds, Arctic cod and other fish. These fish form a critical food source for ringed seals, black guillemots, belugas, narwhals and other predators. As the apex predator in the ecosystem, polar bears depend directly on the production of the ice algae and phytoplankton blooms that support their prey: seals, walrus, and occasionally narwhals and belugas. This short period of productivity in the spring is essential to sustain the entire Arctic ecosystem. Many Arctic species, like seals and polar bears, consume nearly all of their food for the year during the few short months when the receding annual ice is brimming with life. 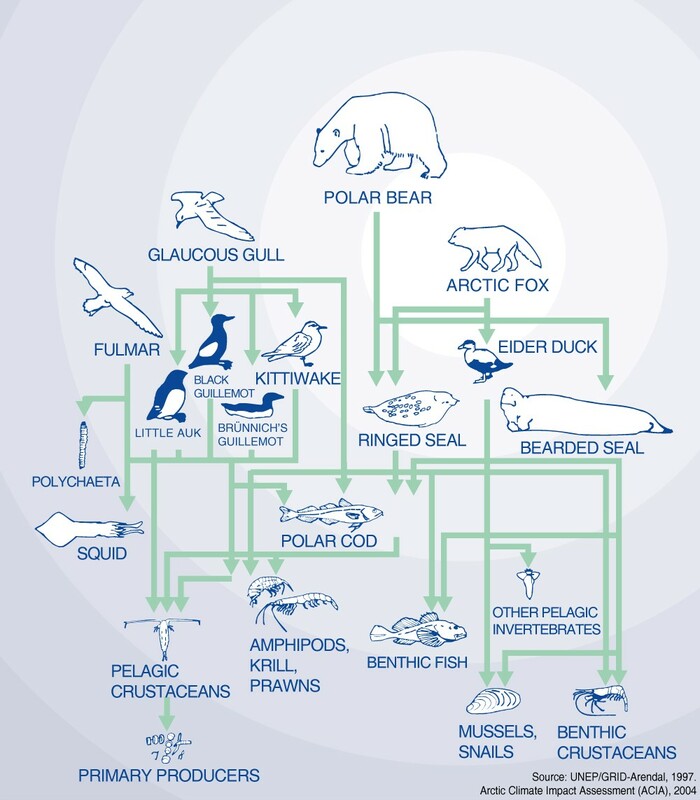 In addition to being the driver behind the food web, sea ice is also critical habitat for Arctic vertebrates. Arctic seals are dependent on annual sea ice for giving birth, nursing their pups and molting their coats in the spring. As the ice breaks up earlier, seal pups are forced into the water before they are ready, making them more prone to drowning. Walrus use sea ice to haul out and mate, as well as for passive transport and resting. In the absence of ice, walrus have been observed hauled out in unprecedented densities on beaches, leading to increased competition and even trampling of young. Bowhead whales rely on sea ice for protection from killer whales, and may even use ice to amplify their songs. 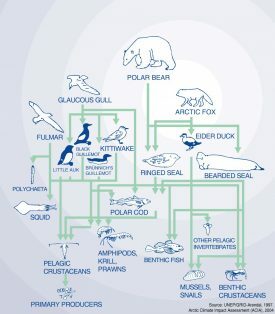 All of these species depend on the sea ice, and as it retreats earlier and forms later they are left without critical habitat and food resources. 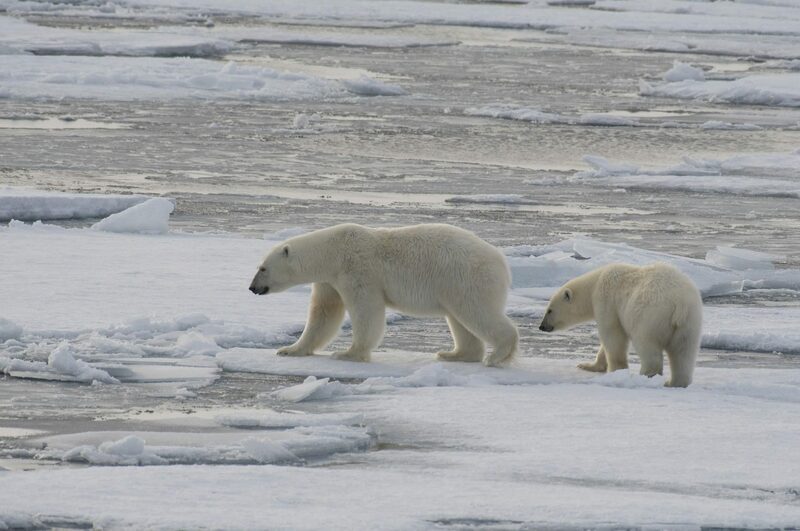 The presence of sea ice in the Arctic has shaped the evolution of the species that live there. 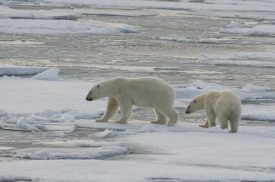 They depend on the ice for survival, and now the ice is changing too rapidly for them to adapt to ice-free conditions. Scientists estimate a high probability that the global polar bear population will decrease by at least 30% within in the next three decades—and that’s only one example! Indigenous communities in the Arctic also rely on sea ice to sustain their livelihood. They harvest whales, birds, seals and polar bears as their ancestors have for thousands of years. Increasingly, the sea ice from which they hunt is becoming less stable, limiting their access to hunting grounds and consequently decreasing food and economic security. As the Arctic Ocean is freed of its icy dome, humans look to the opening of Arctic passages as more efficient shipping routes and to the reserves of petroleum trapped below the ocean floor. With oil exploration and an increase in shipping traffic comes a myriad of threats to the marine ecosystem: oil spills, sound pollution, habitat destruction and ship strikes. So, what can be done to mitigate Arctic sea ice loss and conserve this vulnerable ecosystem? Our best hope are global commitments, like the Paris Agreement, for decreasing carbon emissions. 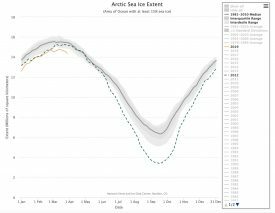 Climate models show that if we can decrease global emissions, we may be able to prevent the Arctic from never having summer sea ice again since greenhouse gases are the root cause of warming temperatures. Though, if we keep polluting at the same rate, the Arctic will likely be 100% ice-free in the summer by 2040, if not sooner.